The kitchen is said to be the heart of the house, as this seems to be where the most traffic is. Meals are prepared, families gather to talk about events of the day, pets gravitate towards this room when they are hungry and in need of social interaction. Some of the best conversations I’ve had with my mom have been while sitting at the oak table that has seen my sisters and me grow up. I’ve been on a table kick lately. 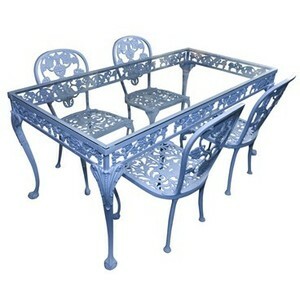 My week has been slammed and I haven’t had a chance to finish my sewing table project, but I did come across this pretty vintage cast aluminum table on Pinterest that I love. I don’t know if I’d paint it periwinkle, though. I’d probably stick with something neutral since I am already painting the sewing table this same color! I love the detail in this table though, and how beautifully simple it is. This would be an eye-catching addition to any kitchen or patio, regardless of what color paint was used. The plan now is to scour the local antique stores in search of something similar, since I already have the glass and have wanted to find a cool base to go with it! That’s all for now… time to get ready for Chris’ family reunion!